What a mischievous little monkey! 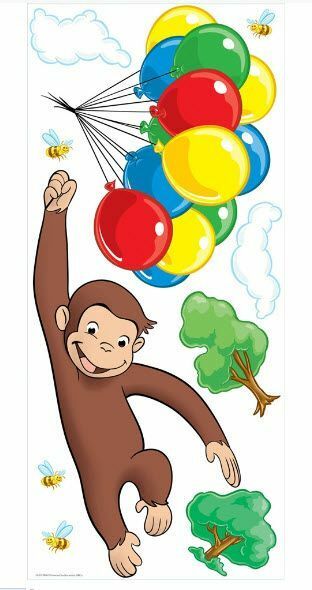 Bring all the fun and wonder of Curious George to your room with this giant wall decal. Create your own mural with this extra large set of wall graphics, including clouds and a bunch of brightly colored balloons. Read the books, watch the cartoons... and now immerse yourself in his world! Be sure to check out our coordinating wall stickers and self adhesive border (both sold separately) for even more fun. • Assembled Elmo 19" x 41"
Disclaimer: Curious George television series merchandise © Universal Studios. Curious George and related characters, created by Margret and H. A. Rey, are copyrighted and trademarked by Houghton Mifflin Company and used under license. Licensed by Universal Studios Licensing LLLP. All rights reserved.